This community of Oakwood Country Club is comprised of just over 3,400 homes and the newest of the five Sun Lakes, Arizona neighborhoods. Located in the Southeast Valley of the Phoenix area, bordering Chandler, this community is situated in an ideal location. Your home will be less than a half hour from the Sky Harbor International and Mesa Gateway Regional Airports and a short distance to all major freeways including the I-10, the 101 and the 202. Homes for sale in Sun Lakes, Arizona include single and two level with square footage ranging from 1,300 square feet to over 3,600. Homes were built in the 1990’s and the newest was built in 2006. Oakwood Country Club homes are mostly built with Integra Block construction for energy efficiency. When you buy a home in Sun Lakes, AZ you are buying a lifestyle. Enjoy 45 holes of golf, 14 tennis and pickleball courts, swimming pools, walking paths, lakes, fitness center, restaurants and so much more! Join a hiking club, biking club or card club. 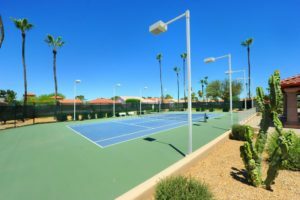 There is literally something for everyone in this 55+ community of Sun Lakes Arizona. See more of the Sun Lakes Arizona lifestyle in our community video below. Are you ready to learn more about Oakwood Country Club? Contact Sun Lakes AZ Realtor specialist The Kolb Team here or call us at 480-440-0849. We look forward to helping you find your next dream home in Sun Lakes Oakwood Country Club!